An agile girl jumping high to catch some stars, that's the logo of Watchever. The German Netflix, "if you want to use an analogy," is an editorialized online video service. 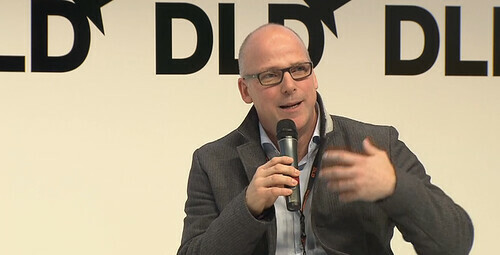 "It's not really our style to say that we are better," humbly said Stefan Schulz, CEO of Berlin based Watchever. "But we are more editorialized and have included more social flavor than others." It's this combination of content advising and social networking experience which adds some spice to a growing business model. "My kids love it!" DLD co-founder Steffi Czerny admitted out loud among the audience. "I mean it, all my three daughters have a subscription." Smartphones or smart TV - what's the right way to deliver content? Stefan Schulz in talks with Ynon Kreiz. What else makes it so special? Actually, Watchever is "the only service in the world that also offers an offline modus." The biggest challenge, however, is to provide a great line-up of content for the customers who consume movies and series in an incredible short amount of time. "My plans are to deliver more of what my customers want," and not necessarily roll out this model to other markets. As "smartphones become bigger and bigger," so that the lines to smart TV are blurring, both are the right way to deliver content. Two out of three customers already are smart TV or tablet users. However, Stefan Schulz concluded: "the most dominant screen in the house will still be the TV, for sure."